Considered as a major energy source, natural gas extracted from earth as a raw material, needs to be treated and purified before being used by industries and customers. Nitrogen is one of the major contaminants which must be removed through Nitrogen Rejection Units (NRU) as it lowers the calorific value of the natural gas and increases its transport volume. U.S. government's Energy Information Administration predicts that by 2035, 46% of the Unites States' natural gas supply will come from shale gas. In order to remove nitrogen, a common choice on large-scale sites is to send the natural gas stream through a Nitrogen Rejection Unit (NRU). The NRU uses the difference in boiling points of methane (−161.6°C) and nitrogen (−195.69°C) to separate the contaminant from the desired natural gas stream. Brazed aluminum heat exchangers (BAHX) are required to cool the process fluids down to the extremely low temperatures required for this cryogenic distillation. 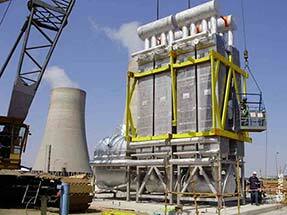 They are also used as condensors and reboilers on the distillation columns. 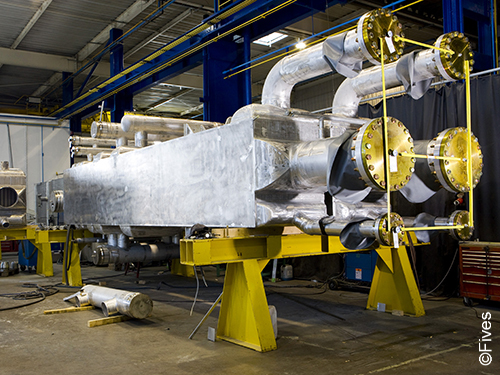 Fives designs and manufactures high performance brazed heat exchangers which are perfectly dedicated to NRU in the natural gas processing industry. Within its Cryogenics | Energy business line, Fives accompanies its customers all along their projects to ensure that the designs meet a project’s specific needs. Fives’ brazed heat exchangers are specially developed to handle up to 20 different fluids, with pressures varying from low to very high pressure. Fives’ dedicated design and R&D engineers also optimize the design of complex brazed heat exchangers and continuously improve the equipment performance thanks to in-house software, renowned for mechanical and thermal simulation.